It seems like everything is equally important when it comes to growing weed. But, the fertilizer and nutrients are vital to the health of your plants and will directly affect your growth potential and potency. The right fertilizer can make a huge difference,and the right nutrients will help your plants flourish. We’ve done all the research and gathered the best nutrients and fertilizers for growing weed in 2019. You can find a good fertilizer for soil or hydroponics growing with a little bit of research. But, we’ve done all the research and believe that the 3 products here are a benefit for most people growing weed. Whether it’s your first grow, or you’re experienced and looking for something new, these products are some of the best on the market. 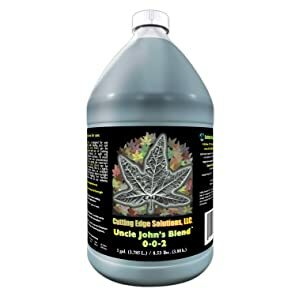 Uncle John’s Blend Growing Additive from Cutting Edge Solutions uses Potassium to stimulate healthier photosynthesis cycles. Because you’re increasing the metabolic rate of your plants, you can expect a healthier, and more perky, plant. The low molecular weight attributes to a clean spray that doesn’t sit heavily on the plants. It’s also difficult to overfeed with a potassium mixture. Although using Uncle John’s Blend Growing Additive is only necessary twice a week, many growers report using it more often without any issue. There’s so much to love about Uncle John’s Blend Growing Additive. Cutting Edge Solutions outdid themselves with this formula. First, we appreciate the clean spray as it doesn’t leave a heavy build-up on your plants. Second, we like how the formula doesn’t try to overload the plants with nutrients. Instead, it uses potassium to stimulate healthy photosynthesis. Finally, we like that it’s usable throughout the entire growth cycle. You can keep giving it to your plants,and it’s not a detriment to their bloom or vegetation states. The only thing we don’t like about Uncle John’s Blend Growing Additive is the price. Although nutrients are an investment in your plant’s well-being and ultimate bloom, these are pricey. The formula doesn’t claim to use organic compounds which might warrant the price. Overall Uncle John’s Blend Growing Additive from Cutting Edge Solutions is an amazing nutrient additive. The quality is above standard, it’s difficult to overfeed, and you can use the same formula throughout the growth cycle. These qualities combine to make a perfect formula for first-time growers. If you’d rather spend a bit more money to ensure you get a good grow, Cutting Edge Solutions makes a great formula. There are a variety of other options from Cutting Edge Solutions as well. Our pick for the potassium-based formula was the focus on improving photosynthesis. Because it’s the basis for all plants nutrient absorption, this product is the best option for creating the right environment for healthy plants. From Orga Grow Holland, we have organic nutrients and liquid fertilizer option. This formula was developed in Holland through years of trial and error. Although they advertise it as made for any plant, it’s specifically designed for cannabis growth. The formula here is a 3-step system to aid your plants from initial planting and well into their bloom. The first step is a root stimulator which acts to encourage root growth and generation. The second step is a growth stimulant. The growth stimulant will help you produce a higher yield. The third and final step is an abundant flowering formula. We like that this formula is a full system. For experienced growers who can accurately track their plant progression and identify when nutrients are necessary this setup is a great option. The root stimulator isn’t a formula you see very often. Getting your plants to take root properly is a frustration that many growers share. The root stimulator is the biggest win from this formula. We don’t like that this doesn’t offer a lot for the new growers. If you’re new to growing, you might miss key signs that indicate it’s time to switch to the next step. There is a risk with both the growth stimulant and that flowering formula of overfeeding. These issues kept the Orga Grow Holland formula from being the best nutrients and fertilizer for growing weed. For the price, this is a quality product. It’s organic and is easy to use in coco fiber, soil, clay pebbles and hydroponic systems. The product itself is versatile, but it relies on the user to have some knowledge about proper feeding and handling of cannabis. The Orga Grow Holland isn’t exceptionally well-known, but it offers quality organic products that can assist experienced growers in increasing their yield and boosting their flowering phase. Fox Farm is a well-known, and well-respected brand in the growing community. 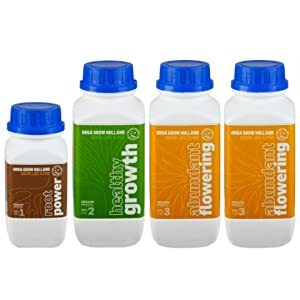 Many growers used these 3 formulas in their first grow and continued to use them for years after. The price, simple formula, and versatility make Fox Farm a top choice for any first-time grower. Not to mention the many experienced growers who still enjoy using it. Fox Farm’s formulas work together to deliver top-notch results. The 3 formulas used here deliver big buds and thriving plants. What we liked specifically was the attention to the vegetative stage. Many formulas ignore the importance of healthy vegetation and focus on producing big buds. There’s nothing to dislike about the Fox Farm formulas. The price is right, the nutrients are stable, and the formulas are simple. If there was anything to nitpick at it’s that many first-time growers don’t know when to switch from one stage to another. We recommend speaking with other growers and watching your plants for specific signs that it’s time to move on to the next round of nutrients. You don’t want to risk missing out on the opportunity to nourish your plants. Overall the Fox Farm Liquid Nutrient Trio Soil Formula is a top option for new growers. Although many experienced growers move on to either more expensive formulas or eventually create their nutrients, this formula is a great starter. You can also use the Big Bloom nutrient additive throughout the entire growth cycle. If you’re worried about overfeeding, Fox Farms has minimal risk of overfeeding your plants. 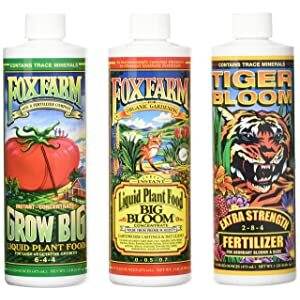 The Tiger Bloom, Grow Big, and Big Bloom formulas use design to allow new growers to have great experiences with their plants. This formula isn’t intended for marijuana use specifically. 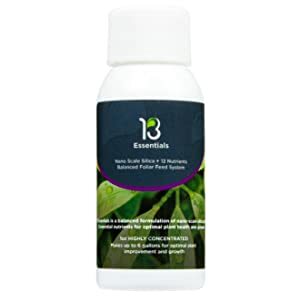 The 13Essentials formula does wonders for nearly any plant though. With 13Essentials you can be sure that your plants are getting nearly all the macronutrients and micronutrients they need. It’s difficult to overfeed with this nutrient option, although it is possible, so be careful! We enjoyed that the 13Essentials focused on what plant’s need to carry out their normal lifecycle. With Potassium and phosphorous as the base, it also uses boron, magnesium, calcium, iron, zinc, manganese, copper and more. The wide array of macro and micronutrients in this formula is causing many growers to use 13Essentials. Unfortunately, the price and the results don’t add up. The price is pretty steep considering that a container only holds one ounce. Then you must mix it down withthe teaspoon. However, each teaspoon significantly diminishes your one ounce supple. Then the results are mixed. Sometimes it works great; the plants are receptive and slowa response to the additive. However, there are regular reports that the formula didn’t do anything. If you’re looking for a fertilizer or nutrient additive that will have an outstanding impact on your plants, this is not the formula for you. However, if you’re looking for something a little extra to give your plants 13Essentials works well. We don’t recommend this product to anyone trying to specifically increase their yield, bud growth, bud size or potency. The 13Essentials formula is purelyto ensure your plants are getting a large volume and variety of both macronutrients and micronutrients. From General Hydroponics, the General Organics Go Box is the first choice for many growers for a few reasons. Frist, the brand has a ton of experience in designing fertilizers for weed. Hands down this are one of the best nutrients and fertilizers for growing weed. But the things to love about it keep going, so if you’re unsure of what option to choose the General Organics Go Box can help guide you towards which nutrients or fertilizer your plants respond best to. If you’re starting out, it’s easy to see how the General Organics Go Box is still the first choice for many growers. The all-organic formulas are great because it’s difficult to find such a diverse set of products that are still organic. Many growers have concerns with ingestion safety when it comes to what they use on their plants. With the all organic formulas, there’s no concern about which products are safe or not. If you by chance get a box that is missing any of the products or has 2 of one product instead, be sure to contact General Hydroponics. They’re well known for taking care of their customers. There is nothing to dislike about this set of liquid fertilizer and nutrients. It works well for both hydroponics, soil fertilizer and alternatives like cocofiber. The price is right and very reasonable given the all organic formula. Although it’s important to note that not all the formulas are OMRI certified. Organic Hydroponics has noted that the lack of certification on some of their products is due to the cost of certification. The Go Box is a top choice for growers regardless of experience or chosen substrate. General Hydroponics continues to make great fertilizers and nutrients for weed plants. The development that went into these products is apparent. Overall, this is a quality purchase,and if anything does go wrong, the company is easy to contact. Not to mention they have outstanding customer service. What goes into choosing the right nutrients and fertilizer? There’s some consideration to a few key aspects including whether the nutrients are water soluble, and whether the fertilizer has all the key components that your plants need. But, the 3 main nutrients that all cannabis plants need are nitrogen, potassium,and phosphorus. On every bag of fertilizer, you’ll see 3 number printed on the front, and these numbers represent what percentage of these nutritional needs the fertilizer provides. The order is always: Nitrogen, Phosphorus, and Potassium. Because your plants need such a wide array of macronutrients it’s likely they can’t get everything they need just from fertilizer. This need has driven the growing community to develop several fantastic nutrient additions. When looking for the right nutrient to add to your fertilizer or water, the huge number of options can be daunting. What you need from added nutrients is a water-soluble base. Whether the nutrients you’re giving your plants are liquid or tablets, they need to disperse with water. Because nutrients enter the plant through the root system most effectively many growers drip the nutrients into the water supply or soil. These elements contribute to the long-term health of the plant and help it through the flowering stage. Lacking in any one of these key micronutrients can greatly affect bud growth and potency. What you essentially want to do is create a diverse a healthy ecosystem of microbes for your plants. If you’re new to growing, you should probably use a pre-made fertilizer with organic nutrients and materials. Planning to compost or build your nutrients hardly ever works out and in the end, the plants suffer because of it. Finding the proper nutrients and fertilizer for your plants will be a labor of love, but hopefully, with these reviews, you can find the best options for you! 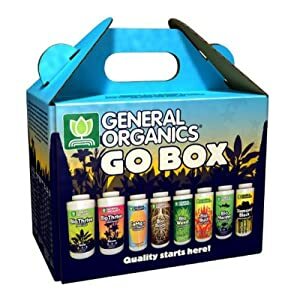 The clear winner here is the General Organics Go Box which comes with a wide variety of products to use at various stages of growth. With root stimulant, vegetative growth support, and bio bud you can be sure that your plants are well taken care of at every stage of their lifecycle. Finding nutrients to add to your plants is difficult if you’re not sure where to start. Because nutrients can both help and hinder growth many people,who are new to growing marijuana stay away from them. But, if you stick with well-known brands that use quality nutrients and well-developed formulas you’re at no risk of diminishing your plant’s growth. 420friendsapp.com is a participant in the Amazon Services LLC Associates Program, an affiliate advertising program designed to provide a means for sites to earn advertising fees by advertising and linking to amazon.com, amazon.ca, amazon.co.uk and any other website that may be affiliated with Amazon Service LLC Associates Program. Copyright © 2019 · 420 Friends. All Rights Reversed.